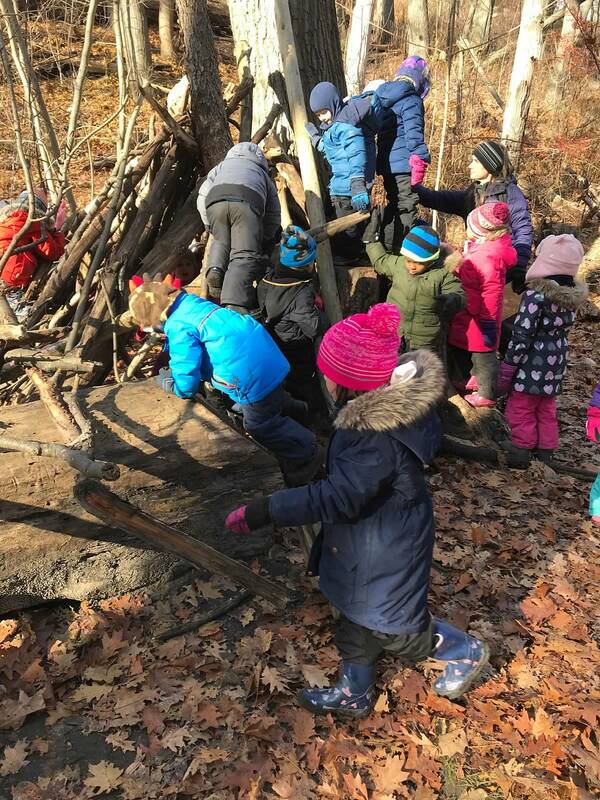 From financial constraints to cold winters, we look at ways to overcome some common obstacles when taking the classroom outside. Let’s talk about risk for a moment. “Risky play” has been a key catchphrase in education recently. We’ve heard that we need to let children take risks to develop physically and mentally, but what we don’t hear about is how to do this. When we, as educators, encourage kids to listen to their “stomach brains,” we have less stress and less worries. This is because when a class of kids all learn to rely on their own instincts and become aware of their own limits and abilities, our jobs become significantly easier. We also have less to do because the kids are asking us for less and figuring out more for themselves. I remember a day recently when I was outside with my class and there were 10 kids working together to build an obstacle course, six kids drawing pictures, five kids making sand soup, four kids reading, and two kids making a large Lego wall. Not one child was asking for my attention and I thought, “Hey, wait a minute, I’m not needed right now, what should I do?” So for the next 20 minutes I watched as the children worked together to create a completely safe bridge with zero adult intervention. In fact, during those 20 minutes, not one child approached me for anything. It was interesting, disconcerting and amazing all at the same time. Making sand soup. Photo: Rebecca Allgeier. I get it, those outdoor classrooms we see online are intimidating and most of us don’t have access to the thousands of dollars needed to create these amazing spaces. That being said, there is so much free stuff out there—garbage day is our weekly Christmas! I remember one day driving down the road and seeing a large headboard for a bed. We picked it up, painted it with chalkboard paint and zip tied it to the fence in front of an old palette that we had also found on the side of the road. Those two items were used as a stage, a teaching area, a bedroom, a school and hundreds of other things over the years. Some of the best learning experiences in our program have started with noticing something cool in someone else’s trash. Plus, there is the bonus of doing something for the environment and taking one more thing out of the landfill. Get the kids involved and you are meeting multiple curriculum expectations! Winter is cold here in Canada. But we acclimate, and the more time we spend outdoors the less we notice the cold. So, if we have the kids outside every day they (and we) get used to it. Plus, being outside in the cold builds our immune systems so everyone gets sick less often! There is truth to the quote that there is no bad weather, just bad clothing. These two questions are the most common after, “even in the winter?” I can only answer these from my experience, but I have never had a kid run from the outdoor classroom. Even my most “challenging” kids are more engaged, more focused, less stressed and less aggressive outside. Now, let me explain that this is not true for the less supervised, less engaging and less interaction-driven “recess time”. 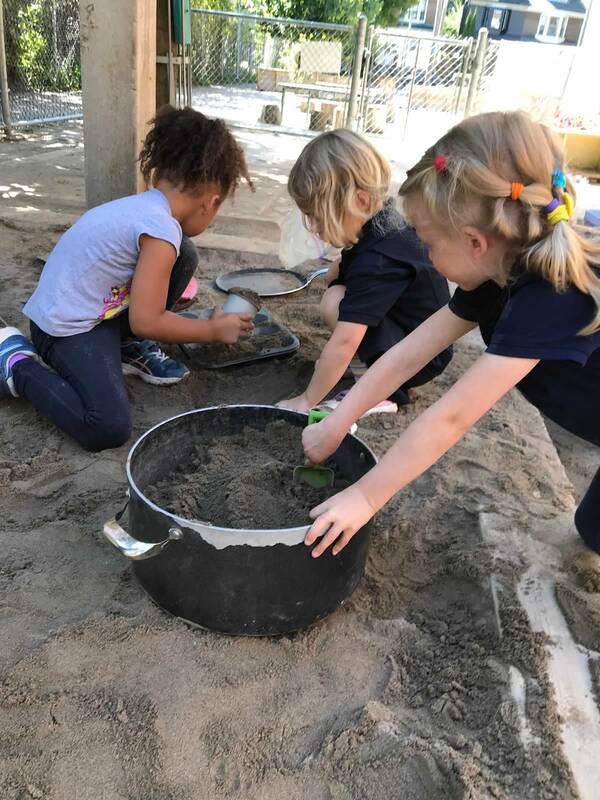 However, when we set up our outdoor environment as an outdoor classroom and engage with the children in the same ways we engage in our indoor classrooms, we all thrive! If the adults use the outdoor time to stand together and chat about their weekend … not so much. I have had kids run from my indoor classroom and have experienced major explosions involving flipping over tables and classroom evacuations. But take these same kids outside, and with practice, teaching, modelling and support, calmness descends. Of course, I mean with practice and repetition. Students that rarely go outside do tend to have a harder time regulating outside, but children who go outside all the time build relationships with the outdoors and engage differently when outside. Building a fort. Photo: Rebecca Allgeier. How can you build relationships with parents and administrators so that they will be your biggest allies? I have had all types of interactions with all types of people, and I am deeply convinced of this: if you steep yourself in the science, the theory, the research and share this with your families, your co-workers, your administrator; if you know the school board policies inside and out; if you treat people as partners, as allies, as teammates, and respectfully model, teach and demonstrate how this can work: most people will see the value and the benefit to the children and come on board. Be honest, be inclusive, be welcoming, and the people who appear at first to be your biggest challenges can become your best teachers. For the families, you need to show you are doing this for the kids. For other staff, you need to show how this makes our jobs easier. For administrators, you need to demonstrate that you are aware of policies, you know your curriculum, you follow best practices and that you won’t cause them to get daily phone calls from concerned families. For everyone, you need to demonstrate how you can meet the curriculum expectations equally in both environments. If you succeed in all these areas, everyone will become your cheerleaders, allies and partners and everyone will benefit. Educators who value and believe in outdoor learning. Children and adults who are inquisitive and imaginative. Everything else you can work with or around!